LOOK: OH REALLY!! TRENDING! KORINA SANCHEZ THE NEW BELO MODEL !! Korina Sanchez as New Belo Model Shares Weight Loss and Beauty Secrets. Handa na ba kayo? Yes, TV host Korina Sanchez-Roxas now looks half her age. 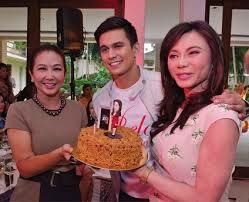 The 53-year old wife of former DILG Secretary Mar Roxas shocked the public after her huge billboard ad promoting Belo Thermage brand by renowned dermatologist Vicki Belo appeared at EDSA over the weekend. Last Monday, she revealed her secrets. “This news never looked this good.” The caption of the ad reads, showing a slimmer Korina Sanchez with her arms resting on an old TV set, with the other hand touching her face. The same ad was also post by Vicki Belo and Korina herself on their Instagram accounts. And as expected, Korina’s ad earned mixed reactions from netizens. 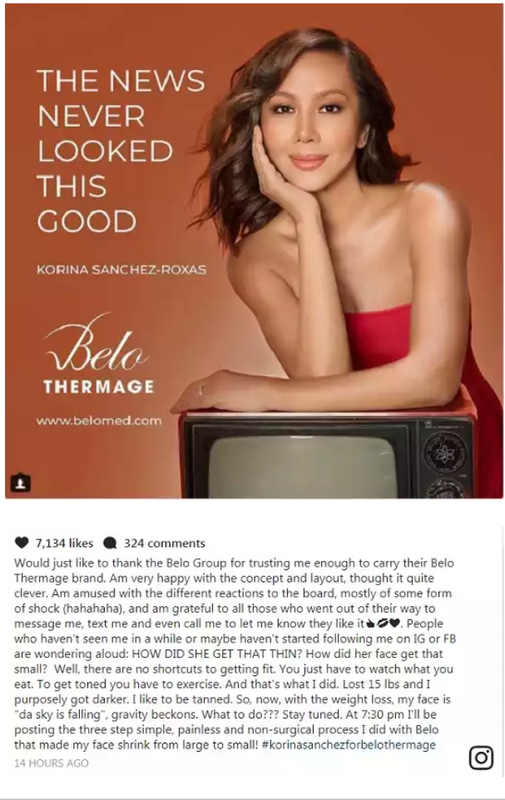 Most netizens said they hardly recognized Korina on her Belo ad, while some of them said it was only a product of Photoshop. But according to her, it was a product of hardships, discipline and some Belo treatment. In her Instagram post, Korina thank the Belo Group for trusting her, and that she was amused with the reactions of the public. “People who haven’t seen me in a while or maybe haven’t started following me on IG or FB are wondering aloud: HOW DID SHE GET THAT THIN? How did her face get that small? Well, there are no shortcuts to getting fit. You just have to watch what you eat. To get toned you have to exercise. And that’s what I did. Lost 15 lbs and I purposely got darker.” She added. “I like to be tanned. So, now, with the weight loss, my face is “da sky is falling”, gravity beckons. What to do??? Stay tuned. 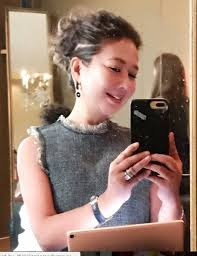 At 7:30 pm I’ll be posting the three step simple, painless and non-surgical process I did with Belo that made my face shrink from large to small!” The Rated K host said, who later posted videos of the non-surgical treatment by Belo. Trending Balita: LOOK: OH REALLY!! TRENDING! KORINA SANCHEZ THE NEW BELO MODEL ! !